Home Insurance How to Surrender LIC Policy before Maturity? LIC policies are essential to ensure that we are protected with the benefit of the LIC Insurance Policy. The insurance policy offered by the LIC sometime does not suit our needs and goals therefore, we are required to surrender our LIC policy to the corporation and unsubscribe from the policy. In this article, we will discuss on how to surrender the LIC Policy and the amount you are entitled to receive after the surrendering of the policy. Special Surrender Value is provided for certain policy only and the surrender value factor required to calculate this value changes every year and is available with the LIC data. Special Surrender Value= (Sum Assured * (No. of premiums paid/No. of premiums payable) + total bonus received)* surrender value factor. How to Surrender LIC Policy? For the policy to become eligible for surrendering you must have to pay the premiums of the policy for at least 3 years. When the policyholder surrenders the policy then the policyholder will be paid back by the corporation in the surrender value. For surrendering the policy you need to visit the LIC Branch where you have availed the policy or contact the LIC Agent. You are required to visit the branch with the below-mentioned documents. 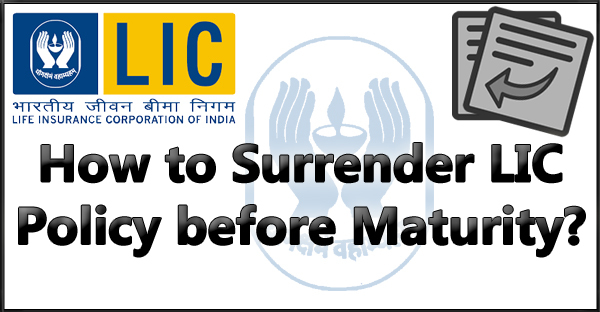 Download LIC Policy Surrender Form No.5074. Bank canceled cheque leaf (your name should be printed on cheque) or bank passbook photocopy. What Will Happen After You Surrender Your LIC Policy? Once you have surrendered your LIC policy you are no longer protected by the Insurance benefit provided by the LIC and no maturity, the death benefit will be payable. Tax Benefits availed under Sec.80C of Income Tax Act will be reversed if the policy is terminated/cease to be in force within 2 years for traditional products and 5 years for ULIP products after the date of commencement of policy.